Dances with difference: Aniqah Choudhri reviews Cathy Marsten and Arthur Pita-choreographed ballets for the all-PoC company Ballet Black. Even before the ballet started I was already seeing the effect of an all-PoC cast. I saw more black and Asian audience members than I have ever seen before at a ballet. It was exhilarating and also threw every other ballet audience I have been a part of into stark contrast. 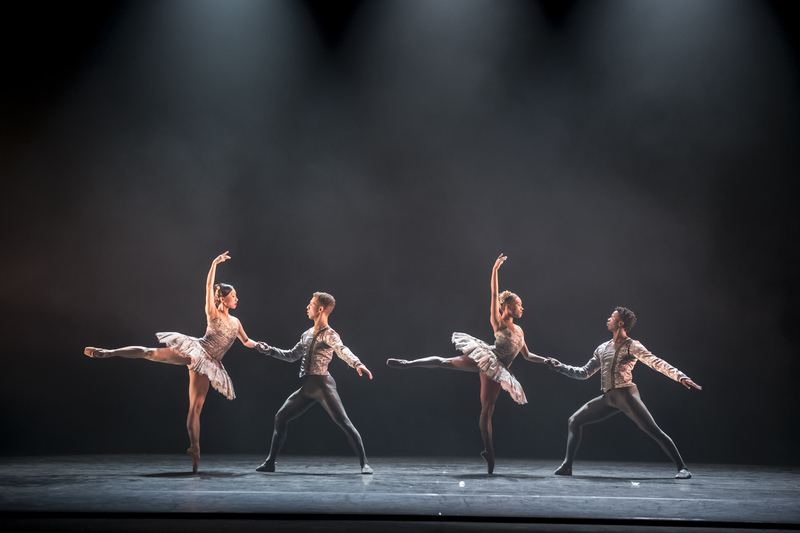 Ballet Black, founded seventeen years ago by artistic director Cassa Pancho to promote Black and Asian dancers gave an exciting performance at The Lowry on Monday night with a double bill of two very different ballets. The first, The Suit, directed and choreographed by Cathy Marston, is a crisp and subtle short piece based on the South African writer, Can Themba’s short story about a married couple named Philemon and Matilda. Philemon walks in on Matilda in the midst of an affair with another man. The man jumps out of the window and leaves his suit behind. Philemon insists the suit stay with them as visible reminder of Matilda’s guilt. I remembered Marsten’s incredible use of space and movement for her production of Jane Eyre. Minimalism is key here and despite the 50s aesthetic to many of the actor’s costumes; long skirts, ponytails, classic suits with bowler hats, there is a timeless feel to the scene on the stage. This piece doesn’t rely on dance alone, although the dancing is wonderfully expressive. The acting blew me away. Philemon played by Jose Alves was almost stoic, genial and yet there is a simmering rage underneath that matches the tension of the screaming violins in the climax of the story. Equally brilliant is Matilda played by Sayaka Ichikawa, a beautiful dancer who began the piece in a cloud of sensuality only to grow more and more brittle until the story reached the shocking end. The stand out for me is the suit itself. From the moment Philemon mechanically puts it together after Matilda’s lover abandons it, it seems to grow a life of its own, becoming a third person in the strained marriage. At one point the chorus make it dance a creepy Pas de Deux with Matilda and this moves the story from unsettling to downright macabre. The inclusion of a chorus is something I recognised from Northern Ballet’s Jane Eyre. The aesthetic eeriness worked more for me than the previous time I saw them and accompanied by the Mancini-style piano music it adds a black comedy element to the production. The second ballet, A Midsummer’s Night Dream, directed and choreographed by Arthur Pita, is a fish of completely different water. It starts with a dramatic and powerful dance sequence. The dancers are in tutus, coupled off in heteronormative pairs; Oberon with Titania, Hermia with Lysander, Helena with Demetrius. Then time stops, Puck enters the stage complete with forest green beard and fountains of glitter and unleashes chaos across the stage. The characters are led into a “forest” accompanied by noises of crickets and frogs and manipulated and match made by Puck, played by Isabela Coracy in an award deserving performance. I didn’t recognise her from a member of the chorus in the first ballet. The rest of the cast has also been shuffled around with Ichikawa now playing Helena and Cira Robinson starring as Titania. Jose Alves returns as Oberon and he and Lysander perform a romantic duet. My favourite Pas de Deux was between Titania and Bottom, played by Mthuthuzeli November who doubles as Dimitri. It starts as comically as you would expect but mellows into an unexpected, dreamlike moving sequence. In fact, considering that you enter this story expecting magic, madness and mayhem, this whole ballet was unexpected. It manages to breathe wonder into a story we think we already know whether it is the lesbian romance between Hermia and Helena or the hair-raising appearance of Salvador Dali. I could have happily watched the whole play with this production but the ballet ended with the same three couples we saw pre- Puck, dancing classically to Handel. Now we have been through the looking glass this is a completely different scene to the audience and throws classical ballet under scrutiny. Arthur Pita stated this was the first time Ballet Black had performed a “tutu ballet” and based on the success of this one it hopefully won’t be the last. Ballet Black was on at The Lowry, Salford on 19 November, and tours until 29 November. More info here.